LONDON - The dollar rose against the yen but weakened versus the euro and sterling on the eve of a speech by US Federal Reserve chairman Ben Bernanke and interest rate decisions in Europe. In late morning European trading on Wednesday, the euro climbed to 1.4713 dollars from 1.4705 dollars in New York late on Tuesday. The dollar advanced to 109.25 yen from 108.85 yen late on Tuesday. On commodity markets, gold soared to a new historic record of 891.70 dollars per ounce on Wednesday owing to rebounding oil prices, a weak dollar and geopolitical tensions, traders said. A falling US dollar makes gold cheaper for buyers using stronger currencies, they added. Markets were gearing up for a key economic speech from Fed chief Bernanke and interest rate calls by the European Central Bank and Bank of England, which were all due on Thursday. "The market remains on a wait-and-see (mode as to) what the central bankers have to say," said Mark Wan, chief analyst at Hang Seng Investment Services Ltd.
"A cut of a quarter point is definite (by the US central bank this month), but there is a chance that the Fed might do a 50-basis-point rate cut," he said. 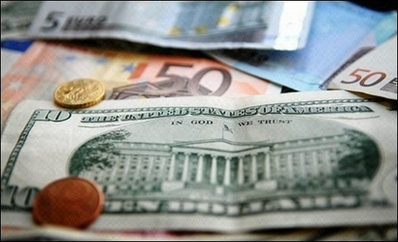 The European Central Bank was expected to keep eurozone interest rates at 4.00 percent. The Bank of England's monetary policy meeting was seen as a closer call after British retailers reported their worst Christmas sales since 2004, dealers said. Last month the British central bank cut rates for the first time in more than two years, by 25 basis points to 5.5 percent. Dealers will be hoping for clues on the outlook for US rates when Bernanke talks in Washington on the economic outlook. "With the earnings outlook bleak equity market investors have to put their hopes on the Fed cutting interest rates aggressively with anything less than a 50 basis points cut on the 30 January likely to be perceived as a disappointment," BNP Paribas analysts said. The US central bank's key interest rate stands at 4.25 percent. In European trading on Wednesday, the euro changed hands at 1.4713 dollars against 1.4705 late Tuesday, at 160.78 yen (160.10), 0.7498 pounds (0.7453) and 1.6366 Swiss francs (1.6362). The dollar stood at 109.25 yen (108.85) and 1.1124 Swiss francs (1.1124). The pound was at 1.9727 dollars (1.9725). On the London Bullion Market, the price of gold stood at 891.70 dollars an ounce from 859.25 dollars late on Tuesday.